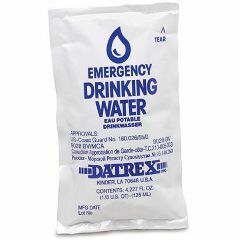 Emergency Drinking Water Pouches provide clean water in a severe emergency or disaster. U.S. Coast Guard approved and a five-year shelf life, reducing the need for replacement and lengthening the life of any emergency kit. Each pouch is extremely durable, compact, lightweight, and easy to open. The 4-oz. size provides important portion control for groups or individuals in an extended emergency. In an emergency, each person should drink a minimum of eight ounces (two pouches) a day. A box of 64 4.227-oz. pouches (2.11 gallons total) provides a three day minimum supply for up to 10 people. Recommend storing up to one gallon per person per day for drinking, cooking, and sanitation. Dimensions: 13"x 6-3/4" x 9-3/4". Weight: 20 lbs.